We are investing in individual career and overall firm growth as a CPA approved training facilitator by providing an enriching and meaningful work environment of positive support, communication, mutual respect, trust and appreciation in which to develop a variety of skills. At Leckie & Associates we understand that our people lie at the heart of our success. We offer excellent compensation and benefit packages along with special rewards and privileges for those who excel and support the team. As a result, our culture first centers around the needs of our clients and the firm as a whole but includes a balance, focusing on individual lives for the best work environment possible. We love our community and we celebrate it at every opportunity. Whether it's dedicating our time to volunteer at community events and organizations, or financial donations, we're happy to support our home town and our neighbours. The firm has a table at most events and encourages team members to attend and get involved. In the past our office has enjoyed fun days including golf days, amazing race day, designed and participated in escape room activities and attended Axe Rising. 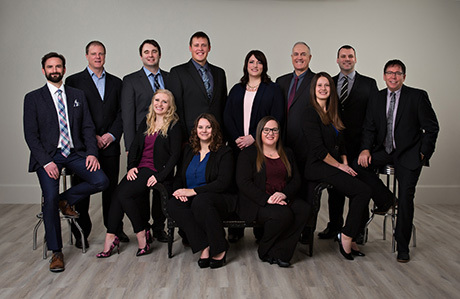 Leckie & Associates currently has seven partners. Five of these partners started as students with the firm, highlighting the importance we place on developing our students to their greatest potential. We are a registered training office for the current CPAB program and will transition to the CPA program as it develops. We offer our students a personalized, three person mentoring program with assistance in planning, studying and evaluation. Our students are given time off to study and take exams. For the Professional Designation exam, our students take the summer off and are able to devote 100% of their time to maximize their success potential. Leckie & Associates LLP provides excellent working conditions, overtime pay and complete group benefits. We have a formal annual review structure with exceptional career opportunities. Our firm is currently accepting applications from students who will be completing their degree this spring in a professional business program and are looking to achieve a chartered professional accountant designation. We are a registered CPA training office and offer generous support and benefits to our students. We encourage all applicants to browse our website for more information regarding our firm. Competitive salary and benefits will be negotiated based on training and experience.